The completed second Environmental Impact Study (EIS) for the Northwest Rail Link (NWRL) was released yesterday, and it has some further details on the project. The new rail line is expected to remove 14 million cars off the road each year in 2021, rising to 20 million by 2036. This 14 million cars figure compares to an earlier figure of 9 million new passengers per year in 2021, prepared by NSW Treasury in July of last year, which suggests that the patronage forecast has been increased following the addition of 2 more stations to the line (Bella Vista and Cudgegong Road) and from higher frequency, higher speed services provided by single deck compared to double deck trains. The estimated completion date remains 2019, with tunneling to begin in 2014, then trackwork and station construction to occur between 2016 and 2018. The new line will commence from the existing stub tunnels at Epping that were designed as the beginning of the Parramatta to Epping Rail Link (PERL). New stub tunnels will be built on the new line to allow for a future PERL to still be built as originally planned. This means that a future PERL will also be a single deck metro system. No specific operating times are given, other than “early morning until late at night”, which suggests similar operating hours as the existing Cityrail network, rather than a 24/7 operation. The trains themselves are listed as having a capacity of 1,300 passengers (presumably including standing passengers), compared to the existing double deck train “crush” capacity of approximately 1,200. The line will see an increase in maximum speeds, from the existing 80km/hour to 100km/hour, and have frequencies of 12 trains per hour during the peak and 6 trains per hour at other times, with the potential to increase frequencies to 20 trains per hour if demanded. Commuters continuing past Chatswood will need to change there for a connecting train, with peak hour frequencies increased to 20 trains an hour on the North Shore line. This means that during peak hour there will be a train every 5 minutes on the NWRL, and every 3 minutes on the North Shore Line. 4,000 new park and ride spaces will be built on selected stations, while all stations on the line (including the existing Epping to Chatswood portion) will have kiss and ride, bike storage, taxi ranks and bus interchanges. Once completed, the bus network will be redesigned to have shorter distance but frequent feeder buses into the new rail line rather than long distance buses connecting directly to the CBD or North Sydney. This had already been announced previously, and no additional specific details are available are included on what the bus network changes will be. The new line also includes a stabling yard on the Cudgegong Road end of the line. 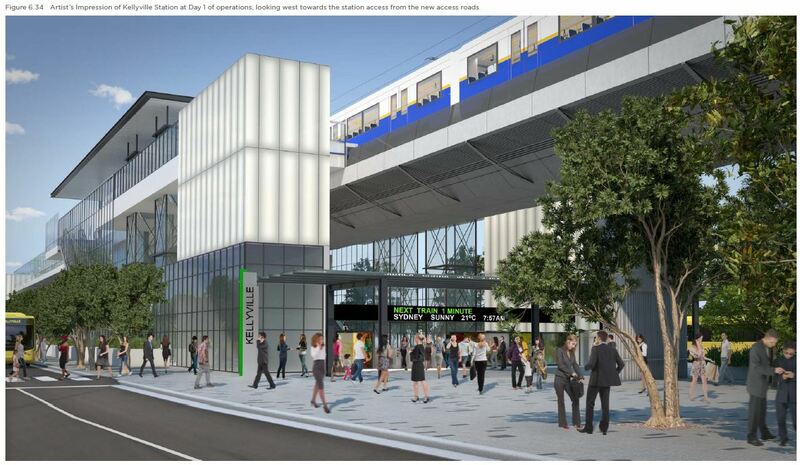 The new single deck metro line from Chatswood to Rouse Hill will require a conversion of the existing line between Chatswood and Epping to be compatible with the new rolling stock. Yet missing from the EIS (or hidden away in a hard to find place) is any mention of a timetable for when this will happen. The line will presumably have to be shut down while this occurs, and this would likely happen right before the full line opens, causing a not insignificant level of disruption. So the question remains: how long will the Epping to Chatswood Line be closed? The EIS also contains information on peak hour frequencies on the North Shore Line of 20 trains per hour. This had already been hinted at, so it is a confirmation of an open secret rather than new information. What is missing is details of what sort of off peak frequencies will exist on the North Shore Line, and how they will be organised to interface with the 6 trains per hour on the NWRL that start and end at Chatswood. Additionally, what will happen on the Northern Line? It only has 1 track pair, yet operates both local (all stops) and express services. The inability of the express services to overtake the local services means the capacity is capped at 8 trains per hour (4 local, 4 express). In order to increase this, either the express trains must be scrapped or the tracks must be quadruplicated to allow express trains to overtake local trains. The latter is preferable, though will incur a price tag of hundreds of millions of dollars, given that the Northern Line currently shares the title of highest level of overcrowding (average passenger levels equal to 150% of seats, above the recommended maximum “crush capacity” of 135%) with the Bankstown Line. Recent reports in the Herald suggest that this option is being considered by Transport for NSW, and this was further reinforced by comments made at recent Budget Estimates hearings where it was argued that these, and other costs, have already been budgeted for. The maximum frequency for the NWRL is quoted as being 20 trains per hour, and not 28 or 30 trains per hour as had been previously suggested in media reports. One of the purported benefits of single deck over double deck trains was the higher frequencies possible given the shorter dwell times and higher acceleration/deceleration rates of single deck trains. In fact, the Transport Minister Gladys Berejiklian has even pointed out that improved signaling technology is expected to raise the frequency of double deck trains to 24 trains per hour. Finally, there is still no answer to the question of whether the NWRL will be a driverless system. The government’s line thus far is that they “are planning for the trains on this important rail link to have drivers”. This new phrase: “no plans” has become the new weasel word, as Sean Nichol’s explained so well in last weekend’s Herald. That is not to say that driverless trains are a bad thing, quite the contrary. But the government knows that it would face a backlash from the union were it to publically declare it was seriously considering the option. And rather than have to wait a long 7 years to demonstrate the benefits of a driverless metro, it seems to have chosen to hold off until as late into the process as it can in order to minimise union clashes. 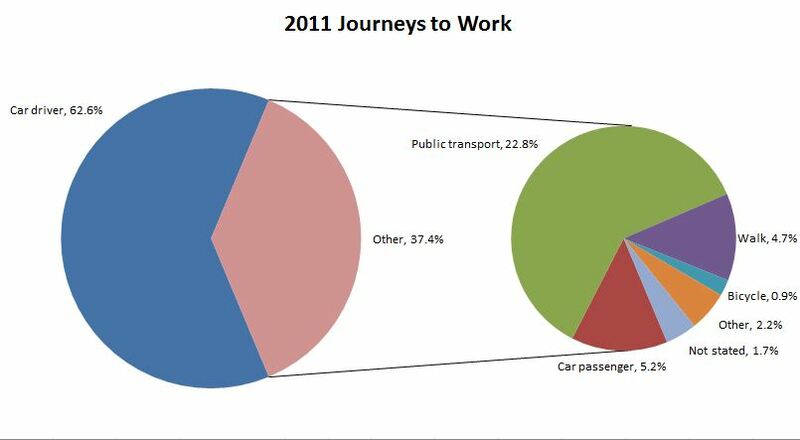 The ABS has released the journey to work data from the 2011 Census (it calls it “travel to work”), and it shows that public and active transport have increased their share of total trips since the previous census in 2006. There were 1,644,247 daily trips to work in Greater Sydney made in 2006, which increased by 9.7% to 1,803,298 in 2011. This means that if a transport mode holds on to its share of trips, then the absolute number of trips has risen. The private car remain the most common mode of trip, with 62.6% of trips made by car drivers and 5.2% made by car passengers, down from 63.5% and 6.1% respectively in 2006 (trips made by truck drivers have been counted as car drivers). However, measured in absolute terms, the total number of trips made by car has risen from 1,144,950 to 1,222,479, and increase of 77,529 or 6.8%. Public transport (including trips where a car is used for a portion of the journey – these trips were not counted in the car trips figure above) have seen an increase in their share of trips, from 20.7% in 2006 to 22.8% in 2011. This is an increase of 20.5% or 70,089 in absolute terms, which is quite similar to the increase in car trips of 77,529. Virtually all the increase in trips from 2006 to 2011 is attributed to either car or public transport trips, and they share this increase almost 50/50. This is in contrast to Infrastructure NSW, which has argued that cars will continue to do the heavy moving when it comes to transport and that roads should therefore receive priority funding over public transport – an argument which requires you to close one eye, tilt your head and stand on one foot to be convincing. The next biggest share is in active transport. In 2006, 4.8% of trips were on foot, which has fallen slightly to 4.7% in 2011. The largest increase has been for bicycles, rising by 44% albeit from a low base of 0.7% in 2006 to 0.9% in 2011. Sydney remains the major Australian city with the highest proportion of public transport trips to work, but also the lowest proportion of bicycle trips to work. Finally there is the other (including taxis and motorbikes) and not stated categories, which taken together were 4.2% in 2006 and 3.9% in 2011. Of interest are the gender differences in mode usage. Some modes of transport see a significant difference in use when looking at its share of use by men or by women. Car drivers tend to be men (65.6%) more than women (58.8%), while car passengers tend to be women (6.9%) rather than men (3.8%). When it comes to public transport, it is used more by women (25.5%) than by men (20.6%), particularly for buses. The biggest disparity between the genders is for bicycles, with men (1.3%) being more likely to ride a bike than women (0.4%). The journey to work data is measured based on trips, and does not take distance into account. (Passenger km are provided separately by the NSW Bureau for Transport Statistics as part of the Household Travel Survey.) Given that the vehicle km per capita for cars has been dropping in recent years, it would not be surprising to see that, when trip distance is taken into account, car’s share of travel is actually declining even faster than the figures above indicate. The 2011 census data on journey’s to work (JTW) is set to be released this coming Wednesday, and it will be interesting to see if there have been any changes since the 2006 data. To prepare for this, here are some links to a few recent blog posts by Chris Loader at Charting Transport and Alan Davies at The Urbanist on the topic of mode share and urban density. 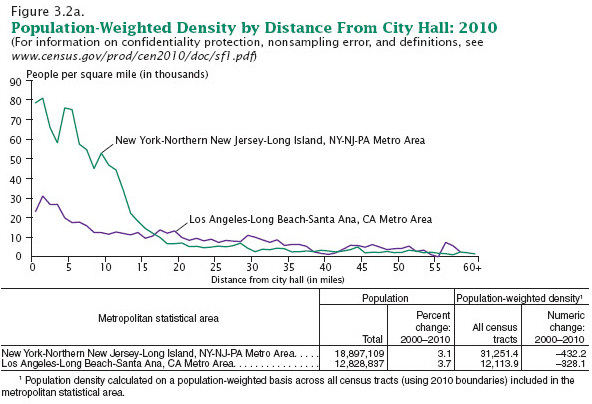 This post points out that if you look at average densities alone, then Los Angeles is actually more dense than New York. However, this is due to New York having an incredibly dense core surrounded by urban sprawl at very low densities. A better measure is the population weighted density, which measures density based on the population density for people, rather than for parcels of land. Taking a more Australian centric look at population density shows that Sydney has the highest density of all Australian cities. In fact, Sydney’s median density of 33 people per hectare is closely followed only by Melbourne at 28, with no other city being above 22. 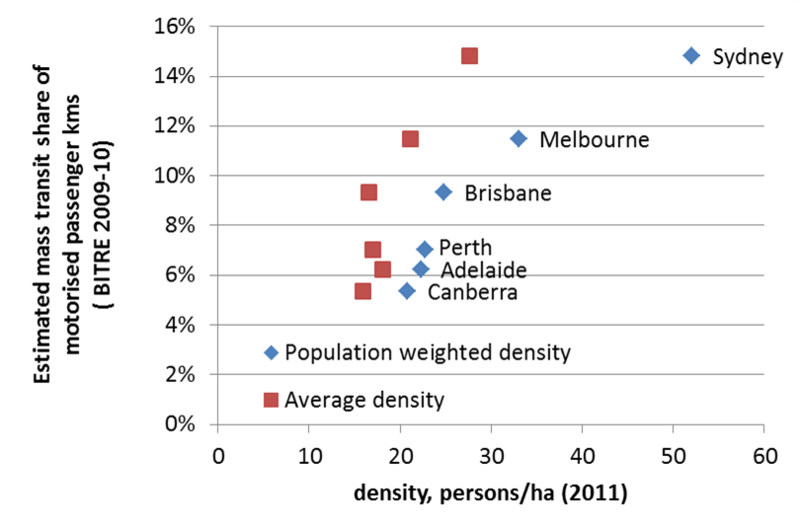 It argues that if suburbs are defined are areas with a population density of 30 people per hectare, then Sydney’s average density doesn’t drop below 30 until you are 39km from the CBD, compared to 9km for Melbourne. The question then arises about whether there is a link between population density and public transport use. Alan Davies finds that weighted population density and public transport use have an R squared of 0.943 when a logarithmic curve is fitted along the graph below, which indicates a very strong correlation. However, he points out that high public transport use is more likely to be caused by dense employment centres (which is covered more in the subsequent Charting Transport blog post). 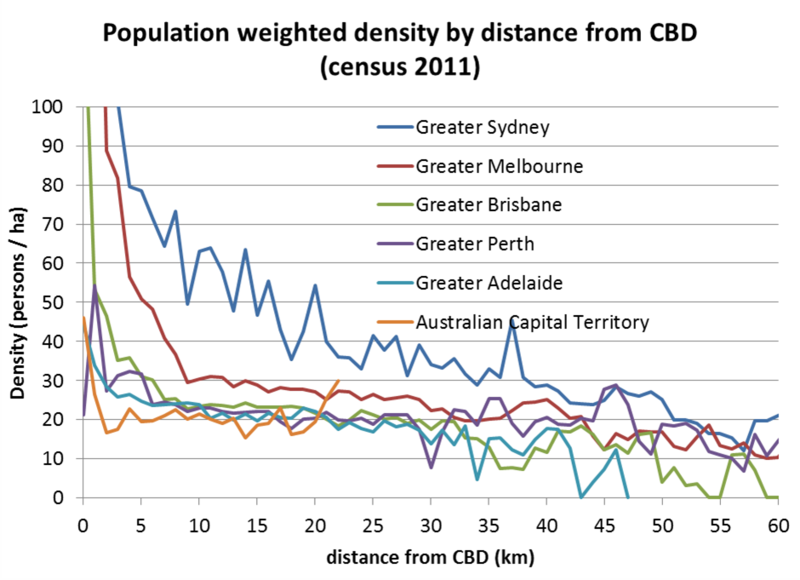 Something that sets Sydney apart from other cities is a large number of dense employment centres, whereas other Australian cities tend to just have their CBD. And public transport usage is higher for Sydney both in CBD travel and travel to non-CBD employment centres in other cities (e.g. the proportion of workers in Bondi Junction, North Sydney, Parramatta, Chatswood, and St Leonards who travel by public transport ranged from 34% to 53%, whereas no centre in any other Australian city was above 15%). However, this is also due to state and local governments in Sydney restricting the amount of parking available for workers, meaning many of them have no choice but to take public transport. When I discussed the main problems I had with Infrastructure NSW’s First Things First report, I mentioned that there were a few other issues I had with it which I had left out for the purposes of brevity. Those two were the potential for high density development along the Parramatta Road corridor and the problems caused by trying to retrofit the Harbour Crossing into a single deck metro system. The cut and cover slot construction method proposed for the M4 East benefits from having much lower costs than a tunnel. The concept art for this shows an increase in housing density along a rejuvenated Parramatta Road (below). Suggestions for increasing housing density along Parramatta Road have been talked about for decades, and the corridor has been spoken of as being able to house some 100,000 residents. But high density needs good quality public transport to work (a motorway is not enough), just as good quality public transport needs high density to work. 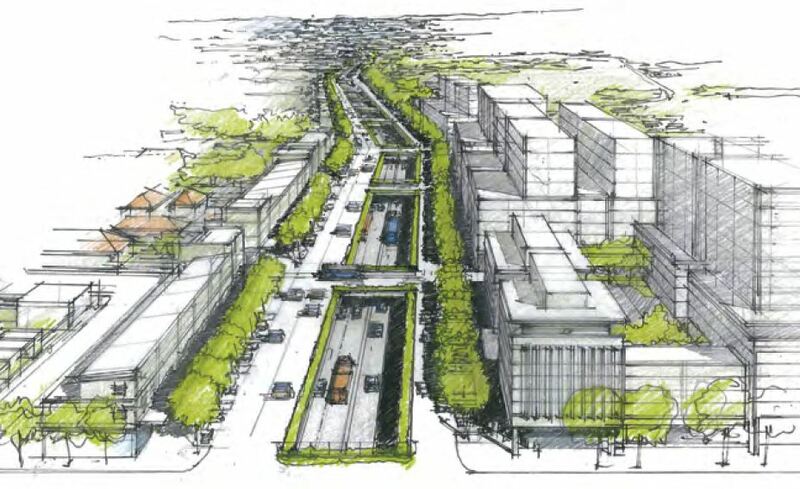 And what this proposal seems to be lacking is improved public transport, either Bus Rapid Transit or Light Rail, perhaps even an underground or aboveground metro, to carry large quantities of people along the corridor. The Urban Taskforce is one group pushing for higher densities along Parramatta Road and its CEO, Chris Johnson, voiced his concerns for just this reason. This means one of two things: the opportunity for high density, walkable, sustainable housing will be squandered, or provision must be made for some kind of mass transit system to be built concurrently with the M4 East. Infrastructure NSW’s insistence that a Second Harbour Crossing it too expensive and should be deferred until it is really needed also has its problems. One would be that the CBD rail lines could be shut down for months and access remain restricted for years as the existing Harbour Crossing is converted to single deck metro capability and then connected to lines that enter the CBD from the South. Such a conversion and link would also occur with a Second Harbour Crossing, but this would involve a new line built through the CBD which ensures that any lost capacity is made up by new capacity through this new line. What the Infrastructure NSW report does not seem to appreciate is the complicated system of connections between different lines. Connecting trains on one line to another can often result in the use of flat junctions, which delay trains on other lines. Think of it like an intersection with traffic lights, if there is a green light for one road then there must be a red light for the other road. This is why there is a system of dives and flyovers on the rail lines between Redfern and Central, to allow trains to move from one line to another without disrupting trains on those other lines. But these connections are limited in what they can do, and to build in new ones to link up the lines the way Infrastructure NSW wants would result in the shut down mentioned earlier. 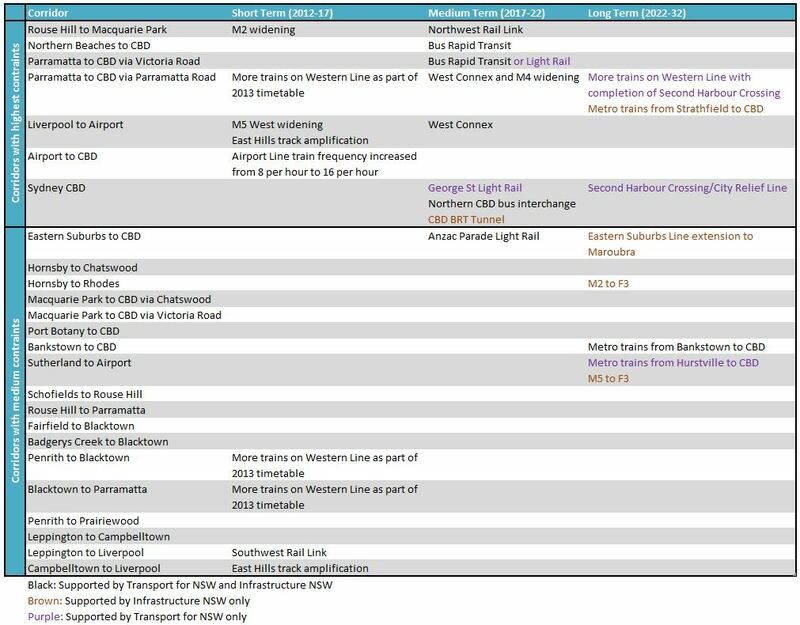 Taking the massive disruptions into account, along with the cost of retrofitting the existing crossing, and the lack of long term capacity improvements that it brings, you have to start to wonder if not building a Second Harbour Crossing really is as unaffordable as Infrastructure NSW makes it out to be. Does Sydney have a third world public transport system? A report by PricewaterhouseCoopers comparing global cities has rated Sydney’s public transport the fourth worst in a group of 27 cities. Only Los Angeles, Sao Paulo, and Johannesburg rated worse. Cities were ranked from 1 to 27, with 27 being the best and 1 being the worst, in 6 different categories. Sydney rates particularly badly when it comes to cost (1), taxis (4), and coverage (7). It gets a more average rating on major construction activity (10), and something called “public transport systems” (17), while doing best on housing (27). The problem with this report is that the definition of urban areas varies from country to country. In Australia, an urban area includes both the CBD/inner city as well as the suburban sprawl, while in most other countries the urban area includes only the CBD/inner city areas. For example, Greater Sydney has a population of around 4.6 million people in an area of 2,250 square km (Source: Wikipedia), while the San Francisco Bay Area has a population 7.2 million people in an area of 18,000 square km (Source: Wikipedia). But when you look at just the core areas of the cities of San Francisco and Sydney, they have a much smaller population (800,000 and 170,000 respectively) and much smaller area (120 and 25 square km respectively). What the report does it to compare Greater Sydney to the central core of the other global cities. 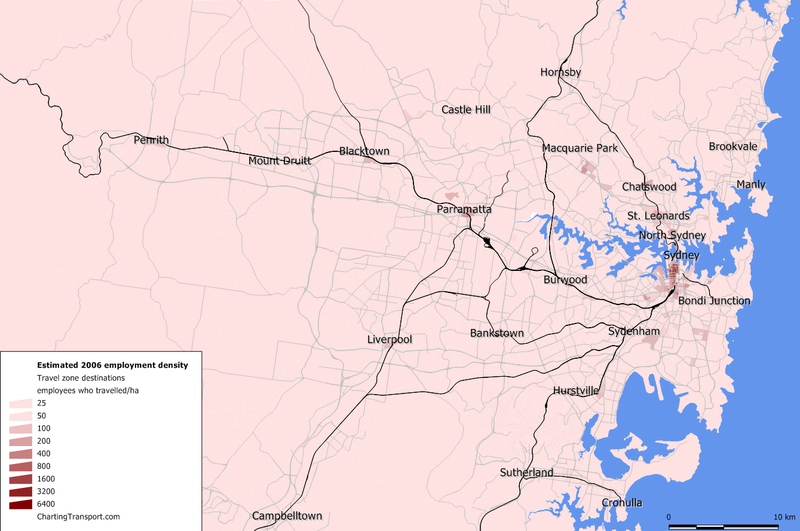 The problem with including Sydney’s outer suburbs in this calculation is that it distorts the results of the study. The cost was calculated based on “the longest mass transit rail trip within a city’s boundaries” (Cities of Opportunity, PwC, page 57), but without adjusting the cost for the distance. Coverage was calculated based on “the kilometers of mass transit track for every 100 square kilometers of developed and developable land area” (Cities of Opportunity, PwC, page 57), which is going to be much worse when you include all the low density suburban areas which cannot sustain the concentration of public transport which a dense core can. These would be fine if it was comparing like with like, but in the case of Sydney, it is not. Also perplexing was the decision to measure public transport systems, where the report says cities are “further differentiated by the extent of multi-modal transport systems, including subway, bus/bus rapid transit, taxi, light rail, tram/trolley/streetcar, commuter rail, and bike share systems” (Cities of Opportunity, PwC, page 95). Here the report confuses having multiple transport modes as an ends, rather than a means. The point of having multiple modes of transport (e.g. catching a bus from a low density suburban area to a nearby train station, then changing onto a train into the CBD) is to improve mobility across a city. But the goal is the improved mobility, not the multiple modes of transport. The multi-modal transport system is the means to and end, which in this case is mobility. While it can often be used as a proxy for improved mobility, it could also indicate a poor transport system that duplicates or competes with itself. Ultimately, most people in Sydney who read the results of this report are likely to agree with it. This is largely due to public transport’s poor image in the public eye, and it’s reports like this which unfortunately add to the poor image problem of Sydney’s transport system, which while in need of improvement, is not as bad as it is often made out to be. UPDATE (27 October): Just realised that references to PwC were accidentally written out as PcW due to my fat fingers. These errors have now been corrected. Despite the conflicting views between the Transport for NSW Transport Master Plan and Infrastructure NSW First Things First report, the two reports actually agree on quite a few things. Both endorse the construction of one large rail project: the Northwest Rail Link, and both endorse the construction of one large road project: the WestConnex. Both endorse distance tolling and time of day tolling (i.e. congestion charging). A summary of the projects recommended, along with the timetable for their construction, is included below. It is split up by transport corridors identified as having high and medium constraints by Transport for NSW, and also colour coded by which department supports each project. Probably the best bit of news is that both agree on what needs to be done in the next 5 years. Even in the medium term, there are only minor differences between the 2 plans, essentially a choice between light rail on George Street or a bus tunnel connecting Town Hall to Wynyard. It’s only in the long term, the 10-20 year window, where serious differences begin to appear. It will be up to the Premier, Barry O’Farrell, and the Transport Minister, Gladys Berejiklian, to make the final decision on which bits of each report to go along with. In an interview with ABC’s 7.30 NSW program, Mr O’Farrell has recently repeated his promise that congestion charging will not be introduced, despite both plans recommending it, and that a Second Harbour Crossing will occur, despite opposition from Infrastructure NSW.